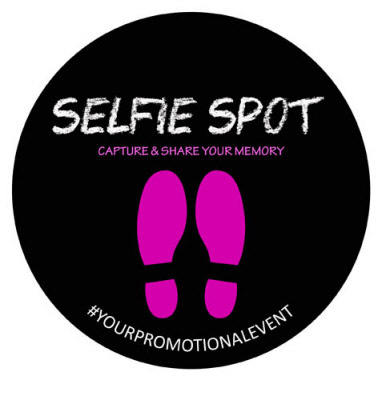 "Selfie Spot" Indoor / Outdoor floor sticker. A perfect Floor Decoration to help share your Promotion . Only £26.00 Each When You Order 5 Stickers. Floor Graphic is made from Peelable Non Slip Vinyl for Long Term Indoor Use (up to 12 months, subject to footfall) or Permanent Non-Slip Vinyl for Short Term Outdoor Use (up to 6 months subject to footfall).